Free Browsing Network is here again with yet another amazing data cheat on Airtel network. Even if there is no free browsing cheat, we must surely browse for almost free of charge. 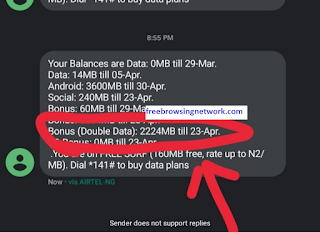 This new Airtel data cheat I will teach you now is the latest method to browse for free on the Airtel network without spending the actual amount used in subscribing. Surprised? I will call this Airtel Reversal Data Cheat. Cool right? Of-course it is. In this post, I will teach you how to enjoy this latest Airtel reversal data cheat. But before then, let's explain how this cheat works. What Is Airtel Reversal Data Cheat? Airtel NG launched a new service that enables users to reverse the money used in subscribing for data. Sounds crazy? Important: MAKE USE OF THE BONUS ONLY!!! After 24hrs you can reverse the initial money you used in subscribing by dialing *121*6# and your data will be reset as well. Subscribe again with your reversed Airtime and use only the bonus data only. Repeat same procedure after 24hrs. Caution! Avoid subscribing to a package that has night plan inclusive. That's all friends. Hope you found this post helpful? Please do leave a comment below and share this post with your friends. Comment on "New Airtel Reversal Data Cheat, Enjoy Unlimited Data For Free"